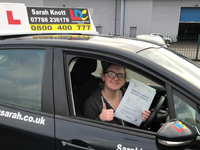 Sarah was recommended to me by a friend and I'm glad she was as I found Sarah the easiest instructor to get on with. Always gave clear instructions and made it easy to understand and I PASSED first time. Thank you Sarah your a star!